've been making a few Thanksgiving cards! Simon Says Stamp has a Thanks/Thanksgiving challenge this week, so it worked out great that I was thinking like them this week!!! I have decided to try to send out a few Thanksgiving cards this year! Simon Says Stamp has a Thanks/Thanksgiving challenge this week, so it worked out great that I was thinking like them this week!!! 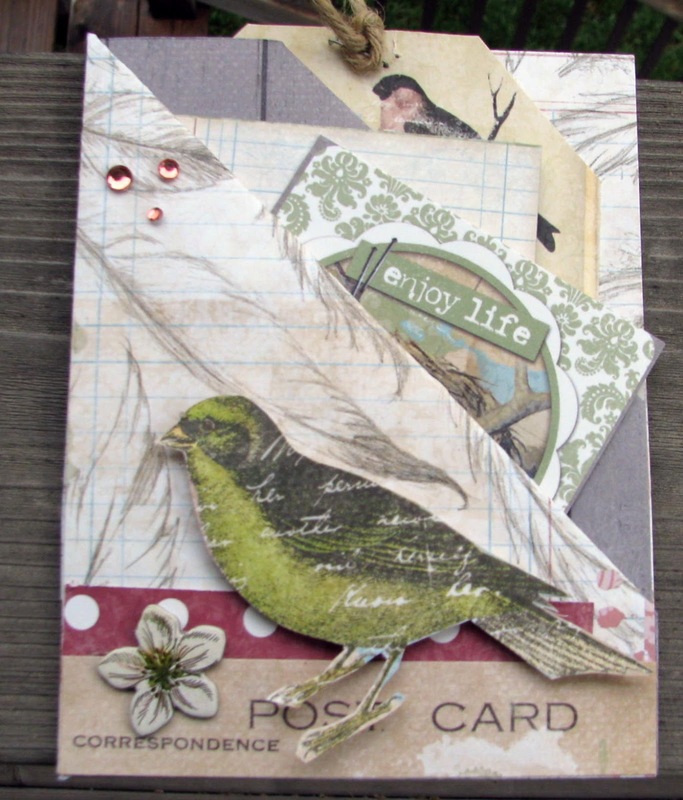 Here's a card for the anything goes challenge at Simon Says stamp! Bo Bunny Genevieve! Here's a card for the anything goes challenge at Simon Says stamp! Bo Bunny Genevieve! It is a gatefold card! I love Bo Bunny Genevieve! I wrapped my Easel card up with ribbon and am entering it in the Simon Says Wrap it Up challenge. I made this card for my nephew's birthday and am entering it in Simon Says stamp Anything Goes. 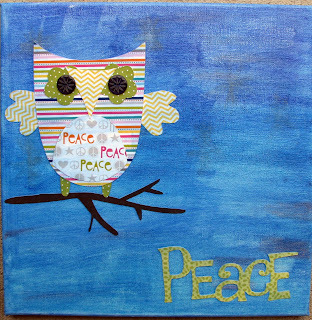 Here is my Peace Owl canvas using 3 colors (blue, grey, and pink) of Faber Castell Gelatos. I love using them on canvas projects! 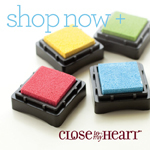 I am entering this in the Simon Says Stamp Challenge: Trio of Colors. 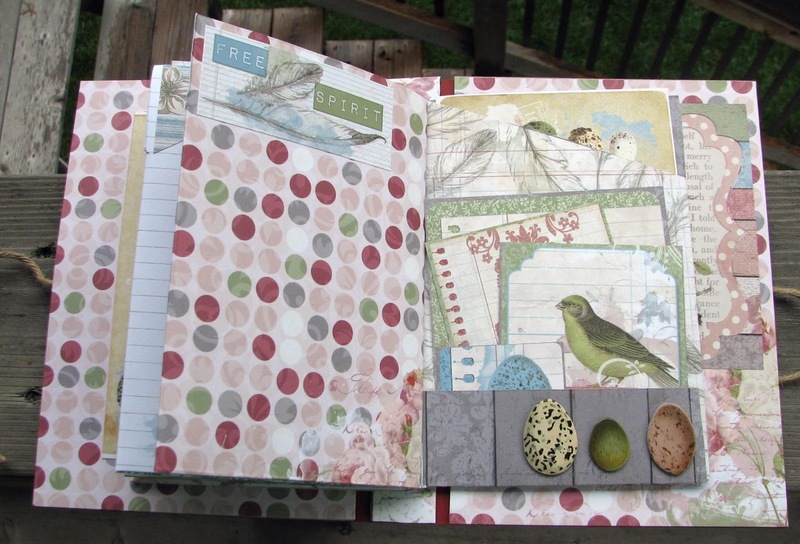 Here's a mini album I made using the gorgeous Bo Bunny garden journal! I am entering it into the Simon Says Stamp Anything Goes challenge. Here's a 3rd card I made using the gorgeous Bo Bunny garden journal! I am entering it into the Simon Says Stamp Anything Goes challenge. 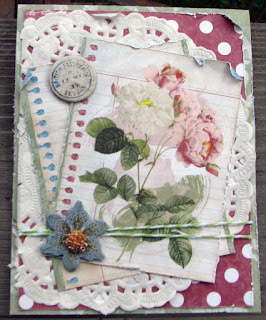 Here's a 2nd card I made using the gorgeous Bo Bunny garden journal! I am entering it into the Simon Says Stamp Anything Goes challenge. 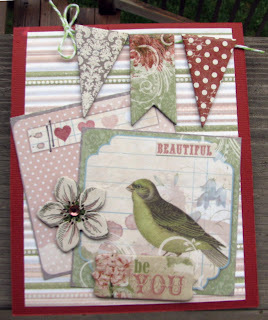 Here's a card I made using the gorgeous Bo Bunny garden journal! I am entering it into the Simon Says Stamp Anything Goes challenge. 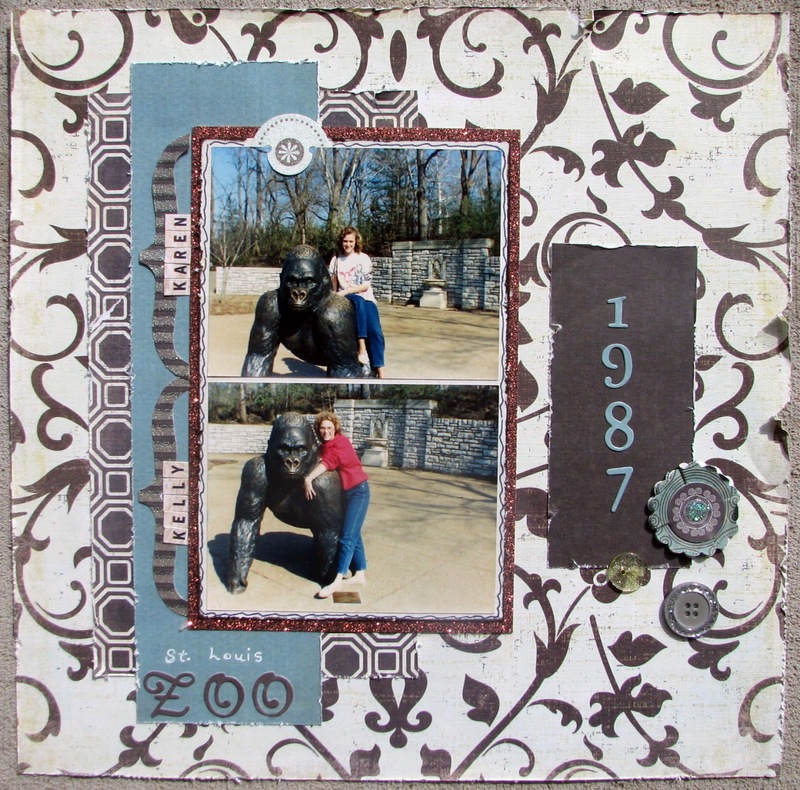 I made this layout of my twin sister and me with the "furry" Phil the gorilla at the St. Louis Zoo. We were about the same age as my sister's daughter and my son! It is weird to think that so much time has passed since this photo!!! Anyway, I saw the photos and thought they would fit great with Simon Says Stamp Furry Friends challenge; so I made this layout!!! Thanks for looking! Hope your summer is going great! 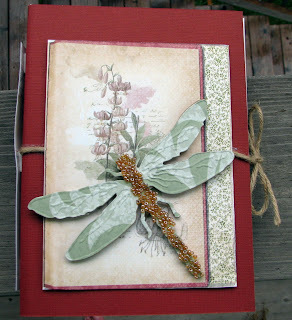 I made this for the masculine challenge over at Simon Says Stamp! The text is all about how mama doesn't want a dog and says "no, no, no" and the boys showing her the photo... and what happens next. 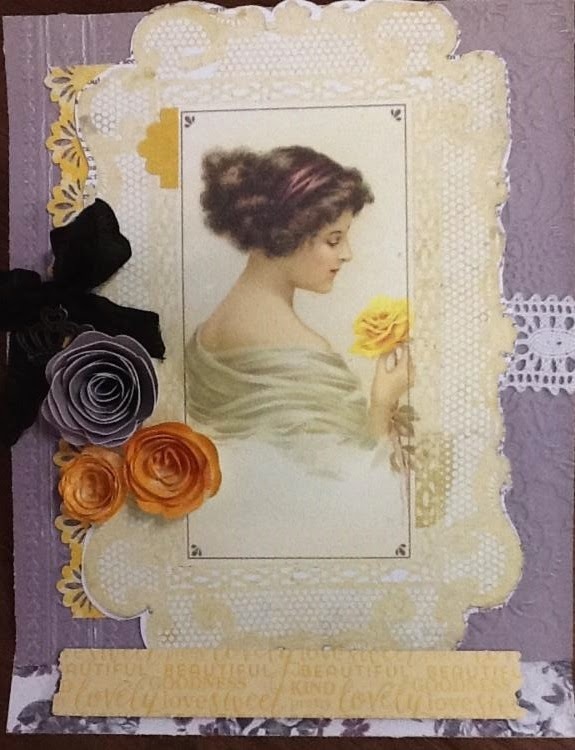 I made this easel card to go with a mini album class I am doing at my LSS Soul Sentiments and put the lady in the middle for the Simon Says In the Middle challenge. I CASEd this card from Simple Stories - they used the wonderful I Am collection. 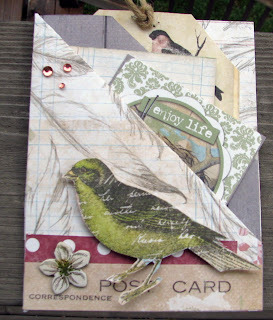 I used some scraps and a cute bird die I had...! I put the bird& mat in the middle of the card to meet the Simon Says In the Middle challenge. I CASEd this card from someone--wish I had saved the photo/name to give credit. I love it so much! I put the butterfly & mat in the top middle of the card to meet the Simon Says In the Middle challenge. I put the daffodils in the middle of the mat to meet the Simon Says In the Middle challenge. I made this birthday card for my twin sister who has a May birthday.We'll be 50 this year!!! I am entering it in the Simon Says Happy Birthday challenge! I made this birthday card for my son who has an April birthday and will be 21. I am entering it in the Simon Says Happy Birthday challenge! I made this birthday card for my niece who has an April birthday. I am entering it in the Simon Says Happy Birthday challenge! I made this birthday card for my boss who has an April birthday. I am entering it in the Simon Says Happy Birthday challenge! HAPPY EASTER!! He has risen! I made this simple birthday (but still striking in person) card for my Aunt who has an April birthday. I am entering it in the Simon Says Happy Birthday challenge! I'm excited to be making this album out of the beautiful (really) new collection from Authentique called Classique Beauty. I thought it captured the photos of my beautiful mother (and father) perfectly!!! 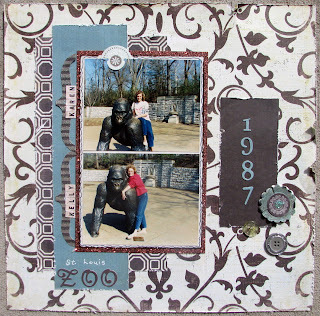 I'm going to be using it to teach a class at my awesome local scrapbook store! I am entering it into Simon Says sTamp B challenge (Beauty) also! It is very cool that Authentique is also having a contest so we can win some of their goodness--made in the U.S.A. goodies!!! I have a lot of photos sitting patiently waiting for me to scrapbook. 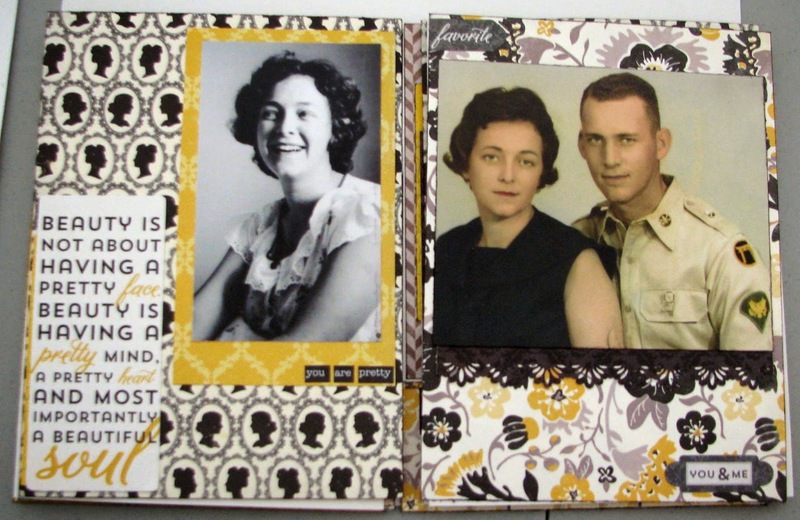 When I saw Simon Says Stamp H Challenge, I knew I should scrapbook some of my son and his darling girlfriend's homecoming photos. 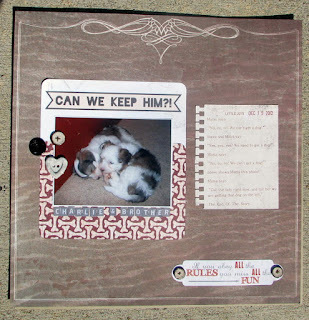 I created this layout of my son and his darling girlfriend using new Christmas collections from Carta Bella (background patterned paper) and Teresa Collins (joy and Homecoming) for the Simon Says Stamp Something New Challenge.